I absolutely adore Pinterest. It doesn’t matter if half of the projects I try don’t work. I made my own modge podge. Just because it turned out to be only slightly sticky goo that was useless is beyond the point. I made something unique. I have two unfinished Pinterest projects sitting around the house. Mostly, because the advertised simplicity has turned into several weekends of sheer dedication. Needless to say, it’ll be a while before I finish. That’s the main reason that I look to Pinterest for inspiration, but don’t alwasy give into the temptation. I never know what I’m getting myself into. Last night I made an exception. I found a recipe for Lemon Chicken Fettuccine, had all of the ingredients and gave into the drool worthy picture. My main reason for sharing this recipe with you today is simple – it was delicious! My husband wholeheartedly agreed and have already had to discuss who is getting the leftovers. I would make it again in a heartbeat. For those of you who know me, I like to play with recipes. I’ll make substitutions based on what I have in the fridge and adjust here or there. I made no exception last night. 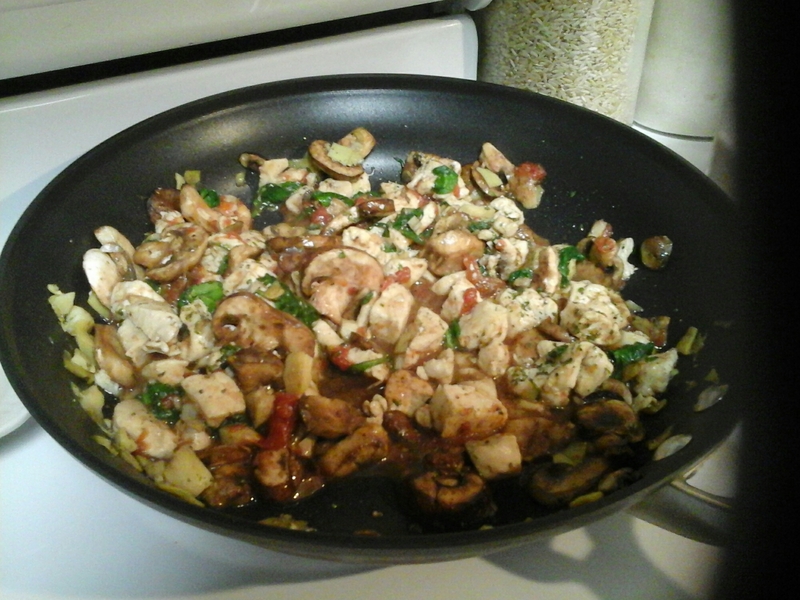 The original recipe calls for chicken, mushrooms and fresh tomatoes. I didn’t have any fresh tomatoes, so I used canned. (The recipe cooks the tomatoes so you don’t notice the difference.) I also had some fresh spinach and artichokes in the fridge that I decided to add. The flavors blended together perfectly. I also substituted lemon pepper for pepper at every opportunity. I wanted the chicken, veggies and the sauce to have a nice balance of lemon. Obviously, if I’m sharing the recipe with you then it turned out just right. My favorite bit of happiness to announce: I wouldn’t make anymore alterations. What was created last night was perfect. Paired with the right white wine it’s heavenly. 1.) Boil pasta while you make the sauce. Ideally, you want the pasta and the sauce to finish at the same time to avoid overcooking. 2.) In a large saute pan, add 1 tablespoon of olive oil and warm to medium heat. Saute the diced chicken seasoned generously with lemon pepper and a dash of salt until brown. Add mushrooms. 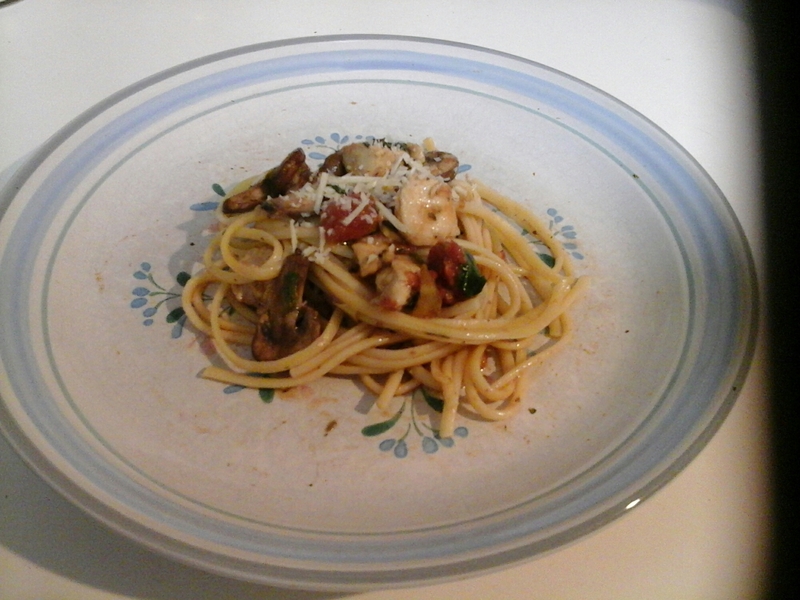 Cook 3-5 minutes and add diced tomatoes, artichoke hearts and fresh spinach. When spinach has wilted, reduce heat and add 1 tablespoon of parsley, a dash of lemon pepper and a dash of salt. 3.) Create the sauce in a separate bowl or cup. Add two tablespoons olive oil, the juice of 1 lemon, to taste. (Because you are using a lot of lemon pepper, you may not need as much lemon juice. Adjust accordingly.) Add a dash of salt, 1/4 tsp of lemon pepper and the garlic powder. Taste and perfect to your preference. 4.) When the pasta is done, add it to the saute pan of veggies and pour in lemon oil sauce. Toss to combine. Serve with a small sprinkle of parmesan cheese and enjoy!